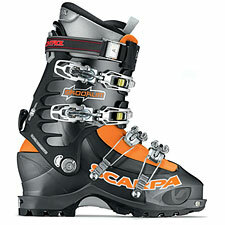 I was under the impression Scarpa's new Skookum was a Frankenboot of parts borrowed from other Scarpa models in an evil-genius attempt to create a downhill performance monster. To my surprise, this monster proved remarkably well mannered on both the uphill and downhill side of the equation—plus at a measured seven pounds, ten ounces (size 26), the Skookum weighs less on my scale than Scarpa's climbing-oriented Spirit 4 (albeit at one shell size smaller). Perhaps we should recheck Scarpa's official description to see if we've missed something? No: Scarpa calls the Skookum, 'Alpine Touring meets King Kong!' But here's a clue: they also label the Skookum their most powerful touring boot. If I seem a little confused, it's because the Skookum strikes me as exactly the boot the Spirit 4 was supposed to be. The Skookum offers a wonderfully-lively downhill ride at a weight low enough to make it your one-and-only Alpine Touring boot. Like its Spirit 3 and 4 cousins, Scarpa's Skookum employs a hinged tongue design, rather than the more Alpine-oriented overlap construction of, for example, Garmont's Radium boot. I've skied a variety of overlap vs. hinged tongue boots, and my take is that overlap boots deliver a more traditional, performance-oriented Alpine boot 'feel' on the downhill, while hinged tongue boots are more comfortable in climbing mode. The Skookum did not change my mind in this regard, but I must say it delivered easily the most natural downhill feel of any hinged tongue boot I've yet tried. The Skookum is the sort of boot that quickly brings a smile to your face. I was struck right away with how much fun the boot was: a clean, natural feel on the downhill, reminiscent of the best aspects of the classic Mega Ride, but with a much more solid sense of control. The Skookum is quick and lively underfoot—and light. It is not as stiff as I was expecting: heavier 'performance' skiers may find it a tad too soft, particularly with regard to forward flex. Again, I'd been programmed to think of the Skookum as primarily a downhill-oriented boot, when in fact I think it is best thought of as a true touring boot: an all-around champ with a very nice balance of up and downhill performance. Contrary to its King Kong allusions, the Skookum is well suited for massive vertical, multi-day tours, and even expedition skiing. And, as with most Scarpa boots, ski mountaineers will find a variety of sport-specific features that speak directly to climbing needs. The Skookum is absolutely an inviting boot when it comes to climbing and touring. I particularly liked the generous toe box, which allowed me to squeeze into a size 26 shell without losing any toenails. In walk mode, the Skookum has a wide range of motion, and I liked the Intuition Speed Pro liner far more than the wrap-around Intuition Precision liner found in the Spirit boots. I think it's also worth saying that for me, the Skookum was the first Scarpa boot where I actually felt like I got it: I understood at once why people speak so favorably about this boot. Whereas with other Scarpa models, I've always found myself admiring individual features rather than the boot as a whole, for me the Skookum instantly made sense. It felt right. After slashing around on the Skookums for a while, I was very curious to see how they would compare to their nearest competitor, Garmont's overlap-construction Radium boot. The Radium has a deserved reputation for a superior downhill ride, and in this regard it once again proved its mettle. On the downhill, the Skookum does not match the Radium's stiffness and control. If you happen to be skiing the Radium versus the Skookum inbounds at a ski area, as I was, you'll find the difference more apparent. The Radium's downhill advantage, however, isn't likely to be as obvious in the backcountry. To anyone who is more familiar or comfortable with the touring gear universe, the Skookum's ride is surprisingly evolved and enjoyable. I should also note that I remain very wary of the Radium's ability to climb comfortably on anything beyond a modest day tour (in fact, I still swap back to my beat-to-hell Mega Rides for more ambitious outings). So, the end result of this comparison just reinforces the stereotypes: the overlap boot has the sharper, more performance-oriented ride, and the hinged tongue boot (the Skookum) climbs circles around it. But to that statement, let me add that the Skookum's downhill performance remains the best I've seen from a boot of its type. I was absolutely impressed. I have long complained about Scarpa's refusal to make me a boot with a flat interior. The rounded hump on the typical Scarpa last causes inevitable problems if the natural shape of your foot's arch doesn't match the boot's shape, or when you add a hard supportive orthotic footbed. However, unlike the two Spirit models, the Skookum actually ships with a fitted boot board to help mitigate this issue. Notice that I say mitigate: oddly enough, the boot boards do not provide a flat surface for the liner to sit upon. Instead, they simply reduce the humpiness of the hump—subjectively, to about the equivalence of a Garmont last, such as the Mega Ride or the Radium, which isn't perfect, but is admittedly a big improvement. On the subject of footbeds, Scarpa seems to feel that the Intuition liner is good enough on its own to be used without a footbed. This is no doubt blasphemous talk in the halls of many a bootfitter's shop, but Scarpa does have a point: for many backcountry skiers, the shape of the last plus the Intuition liner is good enough. I do wonder, however, how much better the Skookum would have fared versus the Radium if I'd been on a custom footbed to even out the comparison. Don't be confused by the Skookum's King Kong marketing pitch—this is one of my favorite all-around Alpine Touring boots to date. The Skookum is not a heavy downhill-oriented beast ala Black Diamond's Factor, nor is it quite as sharp pointed down as Garmont's Radium, but it offers a sweet-spot feel heading down matched with impressive climbing chops heading back up.